Summary: When a building bursts into flames on a cold winter night in D.C., investigators see a resemblance to a string of recent fires in the area. There is one difference, however: This one has a human casualty. The local team insists they're looking for a young white male, suffering from an uncontrollable impulse to act out his anger or sexual aggression. But when special agent Maggie O'Dell is called in, everything she sees leads her to believe that this is the work of a calculating and controlled criminal. 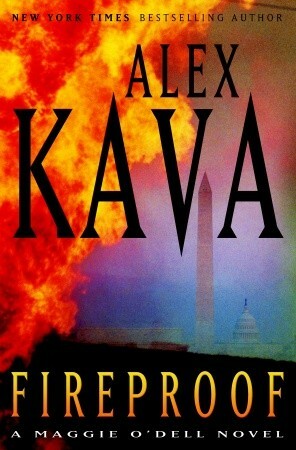 FIREPROOF by Alex Kava is the tenth book in a series featuring Maggie O’Dell, an FBI profiler. A string of abandoned warehouse arsons in Washington D.C. prompt Metropolitan Police Detective Julia Racine to call in the FBI and Maggie O’Dell. The case becomes more complex when two bodies are found at the latest warehouse fire. Maggie must determine if the arsonist has escalated his crime spree or if two separate crimes were committed. Enter Jeffrey Cole, an ambitious news reporter, who decides to make Maggie part of his news feature on the fires. This intrusion into her private life doesn’t sit well with Maggie. The case is further complicated by several personal battles Maggie must deal with. First, Maggie is recovering from a gun shot wound from her last assignment and is suffering severe headaches. Her FBI superiors insist she meet with psychiatrist Dr. James Kernal, an old nemesis. Second is her on again-off again relationship with Dr. Benjamin Platt and third is her mother’s objection to Maggie’s friendship with her half-brother Patrick. Patrick happens to be a private firefighter which fits well into the storyline. Finally Maggie senses that she is being stalked. The book contains many characters from prior books in the series and references past cases handled by Maggie O’Dell. It would be helpful to have read the prior books in the series to understand all the relationships. FIREPROOF is an easy to read, moderately paced, uncomplicated thriller that would make a good beach book. The story is a little predictable as identity of the arsonist is apparent to the reader long before the final chapter. The uncertainty of whether the confessed arsonist is also a murderer leaves plenty of material for the next book in the Maggie O’Dell series. I like a good beach book. Sometimes that's just the right type of book to read. It seems like for all these series books, even if you can read them as standalones, go better if you follow the series! This sounds like a series I would enjoy, but I'm not sure I can read them in order. I hope you have a blast on your trip and run like you've never run before!